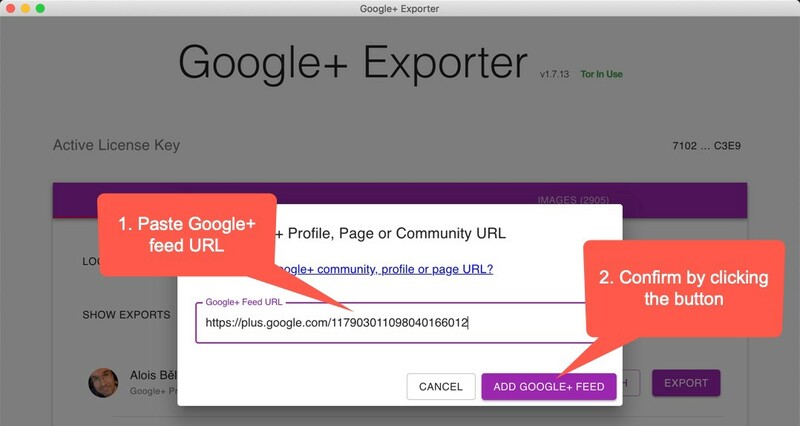 You’ll be using this feature in case the Google+ Exporter did not detected for example Google+ community you’d like to backup or in case you’d like to backup your friend or collegue Google+ feed. This article will help you to get the Google+ profile, page or community URL Where to get Google+ community, profile or page URL? First, open the dialog by clicking the ADD GOOGLE+ PROFILE, PAGE OR COMMUNITY FEED button. Paste the Google+ feed URL and confirm by clicking the ADD GOOGLE+ FEED button. That’s it! Google+ feed will be added to the list of available G+ feeds.